Recently one of our customers shared a fascinating story about a watch lost in the depths of the lower Potomac River while fishing in the 1950′s. 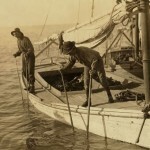 Oystermen use tongs to locate and pull in oysters. At the time, the lower Potomac was oyster country. 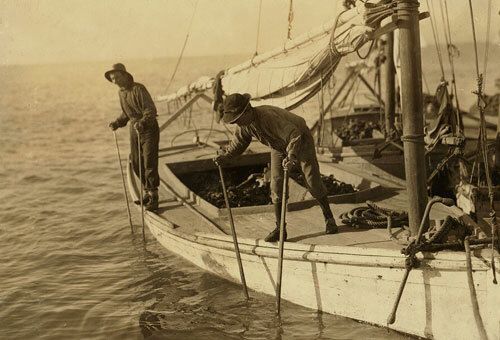 One of the oldest methods of harvesting oysters is to use tongs seven to nine feet long to reach down into the water. A good oysterman had to develop a sixth sense to make any money – the ability to sense what the tongs were touching deep beneath the water’s surface. Pulling up a rock wasted time and would make no money, but getting an oyster paid the bills. The man who lost the watch hired an oysterman to try plumb the Potomac with his tongs and find it. They spent hours upon hours searching the general area in which the watch had been lost. Systematically, the oysterman sensed the bottom of the Potomac through his long tongs until he was sure he felt what he was looking for – a watch. The oysterman was so confident in his touch that he announced his find before he even pulled the watch out of the water! 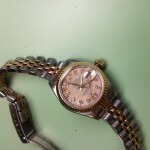 This Rolex Oyster Perpetual Datejust has severe water damage. Restoration is possible! After a thorough service of the movement, refinishing of the dial, and tlc, this watch will look like new! The skill that this oysterman used is simply amazing. While looking for something, we’ve all heard the adage “it’s like finding a needle in a haystack.” Consider that this man found his “needle in a haystack” with a nine foot tong in an area so deep that the bottom could not be seen. He found the needle blindfolded – except in this case, the needle was a watch. This type of skill doesn’t simply develop overnight; it takes thousands of hours of practice. 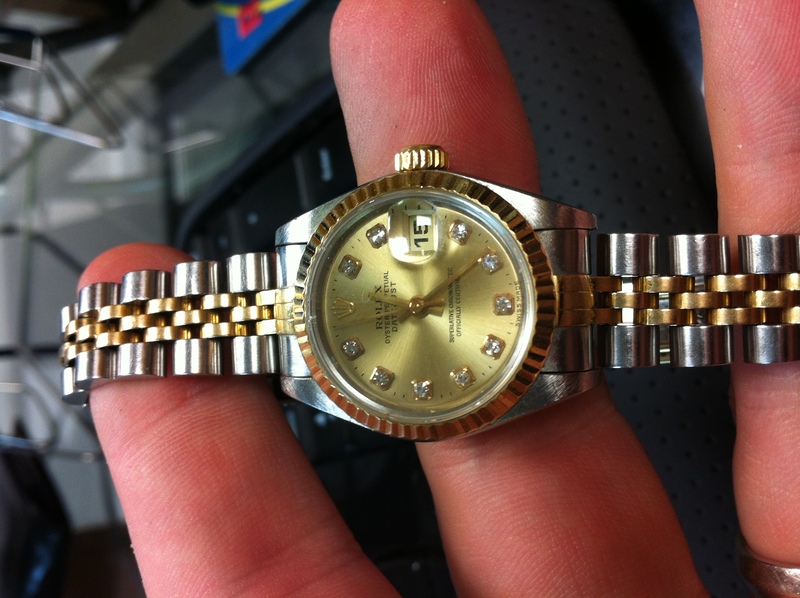 This Rolex Perpetual Datejust needed and got TLC after minor water damage. Watchmaking similarly takes thousands of hours of practice. Every time we receive a watch, remove the movement from its case, and go to work, we develop our touch a little bit more. Thousands of hours are spent repeating the same motion, working on the same movements, maintaining exact standards the entire time. I was so captivated by the story, I forgot to ask our customer what type of watch was tonged from the Potomac that day.In the meantime, I had to check on the status of another Oyster – a Lady’s Rolex that had been sent to us after taking a bath in the piedmont of North Carolina. 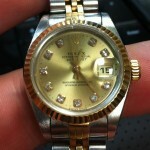 Every day, we service top brand luxury Swiss watches, including Rolex, Omega, and Tag-Heuer. If your watch has taken a swim, we can probably repair it. Or if your watch has been treated well and just needs a standard service, we can also help you. 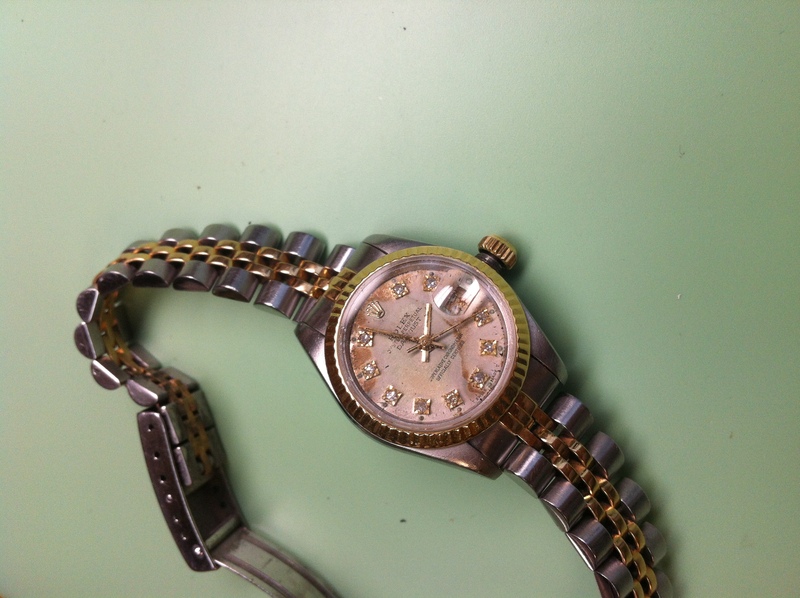 To inquire about having your watch repaired or restored, please call us today at 800-251-1484. We don’t fish for Oysters, but we are experts at repairing them. Our pledge to you is simple: our experienced watchmakers will treat your watch the way they would treat a cherished family heirloom. If you're not 100% satisfied with your repair, we'll refund your payment. Call Matthew at (800) 251-1484 to arrange for your watch to be repaired.